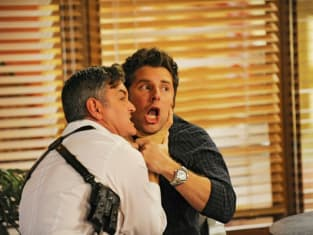 Gus and Shawn are on the case in this Psych scene. It is courtesy of the Season 7 finale. Psych Season 7 Episode 14: "No Trout About It"
Henry: What kind of idiot drives down a public pathway?! Shawn: Hey, that's my dad. HEY DAD! Permalink: Don't hit any humans!